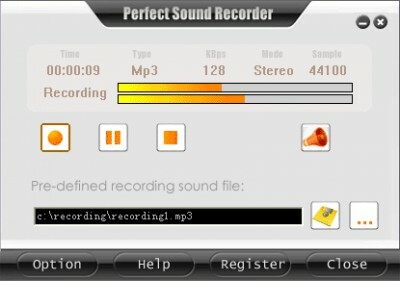 Perfect Sound Recorder 6.6.2 . Perfect Sound Recorder is a professional sound recorder software. With the recorder you can directly digitize recordings of music cassette tapes, streaming Internet audio, vinyl LPs, videos, and meetings directly to your computers hard disk, creating popular mp3 or wave sound files on the fly. Perfect Sound Recorder can record from any sound card input line, from microphone, line-in, cassettes, LPs, to CD, DVD, your home stereo or an MD player. What"s more, it can record sound played by other programs (e.g. RealPlayer, Windows Media Player, Quick Time, WinAmp) including live Internet broadcasts. i-Sound WMA MP3 Sound Recorder Pro 6. All Sound Recorder XP - сумеет записать звук с любого источника. Visual Sound Recorder позволяет записывать звуки проигрываемые в других программах. Free Audio Recorder is an easy to use free software that enables you to record any sound you can hear on your computer, from internet radio stations to streaming music. Advanced Sound Recorder предоставляет расширенные возможности для записи звука с микрофона или любого другого источника.